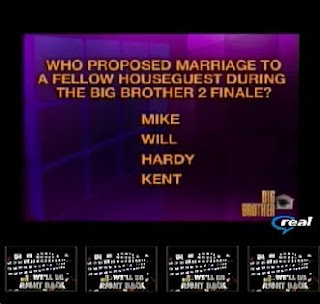 This trivia question was put up after the conclusion of Natalie's claim to being the first person in the "history of Big Brother" to get a proposal. Nice job behind the scenes, my friends. The rumor is that the entire jury house was back, and that Natalie had her choice of who she wanted to talk to. Obviously, she chose Jessie, and the others just made a bunch of noise to distract the rest of the HG's. Edit: I was premature about Natalie having finished her story. She's still going on about her "proposal". Natalie said something about her boyfriend watching the feeds and seeing Jesse profess his love to her. That has to be a CLEAR indication that everything she is saying is a lie. She is so disgusting!That troll and jesse-what a gene pool!! !